Lombard Odier offers the ability to compare investment funds one with other. Impact assessment need not be unique rather it should have a degree of standardisation so that it can be compared to other solutions and that it improves the ability to maximise social impact. Lombard Odier operate as a Fund of Funds (FoF) and hence view their impact as their contribution in being the link between investors and on the ground SPOs. The impact investment market is fragmented and composed of small funds with little track record. Currently lacking in the market is a pipeline in between the impact companies and the investors and this is how impact investors add to the market. There are no comparable peers in the wealth management space providing a FoF. Impact is aggregated at portfolio level and weighted by individual fund’s social performance. 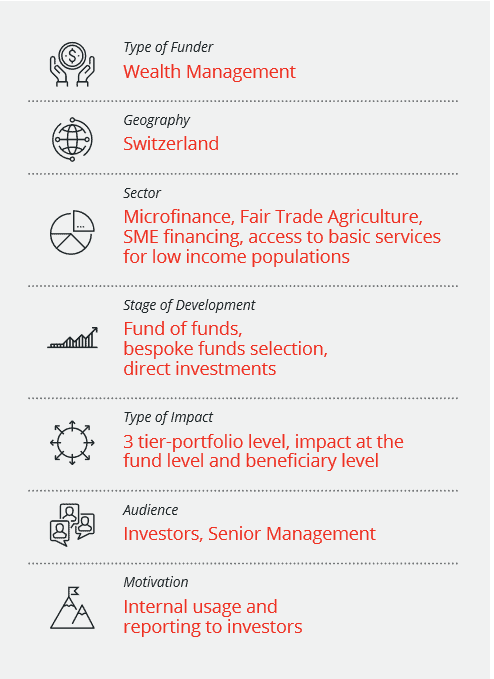 To measure the performance of funds in the portfolio they use social reach, alignment of values, impact measurement, impact management and pre- investment impact analysis as parameters and display this in an Impact Radar. Lombard Odier feels that there is a gap in the market for listing social impact in different sectors open-source based on IRIS for comparison for impact investors. Before investment they check for the intentionality of monitoring social performance and ask for a theory of change. The quality of the impact thesis and metrics being collected is part of their due diligence. They provide investors with a comprehensive social impact report every year, comprising every details of their impact assessment approach. A quarterly newsletter focuses on concrete investee companies, and explain how they positively impact the society.